Noöracetam — If you enjoy being a dingbat, stay away from this stuff! NoöRacetam is LifeLink’s brand of piracetam, a derivative of the neurotransmatter GABA. Piracetam is a noötropic — i.e., a cognitive enhancer. Piracetam, first of the noötropics, has been in clinical and popular use in Europe and elsewhere since the early 1970s. In the U.S., however, government bureaucrats tried for many years to prevent U.S. citizens from having access to cognitive enhancers, despite their well-known effectiveness and excellent safety record. Fortunately, U.S. supplement companies prevailed over the bureaucrats, and piracetam became available to Americans as a nutritional supplement in 2006. The recommended dosage of piracetam ranges from 1.6-9.6 grams per day, taken in divided doses. For blood disorders the usual dosage is 4.8 to 9.6 grams per day divided into three doses about 8 hours apart. Piracetam should be avoided by people with severe impairment of liver or kidneys, or with a history of cerebral hemorrhage. If piracetam is to be discontinued, the dosage should be reduced gradually over a period of several days. 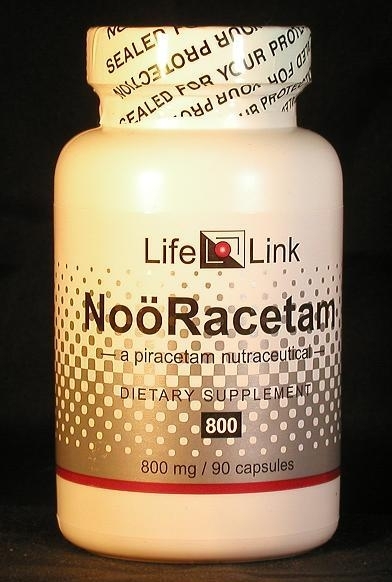 NoöRacetam is LifeLink’s brand of piracetam. Piracetam, a derivative of the neurotransmatter GABA, is a racetam — a category of cognitive enhancers that includes aniracetam, pramiracetam, oxiracetam, and others. Cognitive enhancers are also called “noötropics”. Piracetam was first of the noötropics. Discovered in 1964, it has been in clinical and popular use in Europe and elsewhere since the early 1970s. In the U.S., however, government bureaucrats have waged a campaign against piracetam and other noötropics, using scare tactics1 and gestapo-type actions2,3 to prevent U.S. citizens from having access to them. Despite the harrassment, many people have quietly imported small quantities from Europe for their own use. In view of the fact that piracetam is a simple derivative of the neurotransmitter GABA and has a proven lack of toxicity, it was adopted in 2006 as a nutritional supplement by U.S. supplement companies. Accordingly, we will limit our discussion of NoöRacetam to a brief summary of relevant research, and let you draw your own conclusions about what medical conditions it may be effective in treating. Piracetam’s effects on both nerve cells and on blood may be explained by the fact that it alters the fluidity of membranes of cells.14 Such a change in fluidity would affect the function of various proteins that float in these membranes — proteins such as ion channels in nerve cell membranes, and metabolic enzymes in mitochondrial membranes. Cell membrane fluidity would also affect the ability of blood cells to pass through small veins and capillaries. Why has the U.S. government tried to prevent its citizens from having access to noötropics like piracetam? The official reason is “to keep the public safe” — this is the standard excuse given for police-state behavior. A more plausible explanation might be “to keep the public from becoming too smart”. A smarter public would be less tolerant of corrupt and incompetent government officials. Piracetam should be avoided by people with severe impairment of liver or kidneys, or with cerebral hemorrhage. If piracetam is to be discontinued, the dosage should be reduced gradually over a period of several days. Is NoöRacetam useful for the conditions and purposes mentioned above? We aren’t allowed to tell you, so you should take a look at some of the references cited here, and then decide for yourself.